-- A man who ran a roadside beverage shop in the Mekong Delta province of Vinh Long was filmed on Sunday sabotaging a free water stall set up by the local traffic police force to help commuters quench their thirst on the way home after the long Tet holiday. 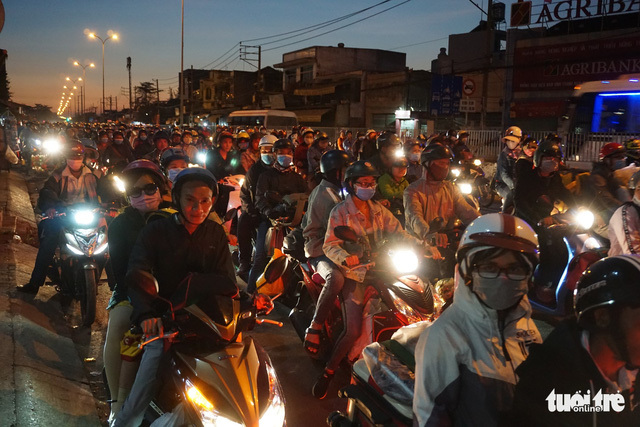 -- Thousands of vehicles were stranded in a massive traffic jam on the My Thuan Bridge that connects Tien Giang and Vinh Long Provinces in southern Vietnam on Sunday evening, with congestion on the lifeline route expected to linger on to Monday as commuters continue to return to Ho Chi Minh City after enjoying the Tet holiday in their hometowns in Mekong Delta provinces. -- As many as 22 people were killed and 19 others injured in 22 traffic accidents that occurred nationwide on February 10, the sixth day of the Lunar New Year, while up to 183 lives were claimed in 276 accidents that occurred over the nine-day holiday. -- Some passengers who booked flights for the Tet travel rush in Vietnam have been scammed by air ticket agents, which printed out booking codes for their customers before canceling the tickets to get a partial refund, leaving the victims stranded at the airport as their names fail to show up in airlines’ systems. -- Analysts believe yearly banking credit growth in Vietnam will ease off in the next three to five years to around 14 percent, lower than the average rate of 18.1 percent in the 2015-17 period, while economic growth is forecast to remain unaffected by the trend. -- Vietnam’s textile and garment sector has set a target of US$40 billion in export turnover in 2019, up 10.8 percent compared to 2018, as the sector is expected to enjoy a trade surplus of $20 billion this year, providing jobs and improving income for around 2.85 million workers, the Vietnam Textile and Apparel Association said in a report. -- There will soon be direct flights between the U.S. and Vietnam as the U.S. Federal Aviation Administration is expected to announce its listing Vietnam as a category-1 destination in the coming weeks, a prerequisite for opening direct flights to and from U.S. soil. -- Hanoi and Ho Chi Minh City have remained among the global Top 10 most dynamic growing cities in JLL’s Short-Term City Momentum Index (CMI) 2019, which tracks socio-economic and commercial real estate growth in 131 cities over a three-year period. -- An annual New Year tree planting festival was launched in the northern province of Yen Bai on Sunday, the sixth day of the Year of the Pig, by Party General Secretary and State President Nguyen Phu Trong, as Vietnam continues to uphold the tradition established by late President Ho Chi Minh in 1959. -- The 2019 Bai Dinh Pagoda Festival, held at Vietnam’s largest complex of Buddhist temples in the northern province of Ninh Binh, was launched on Sunday with the participation of tens of thousands of dignitaries, Buddhists, and visitors.